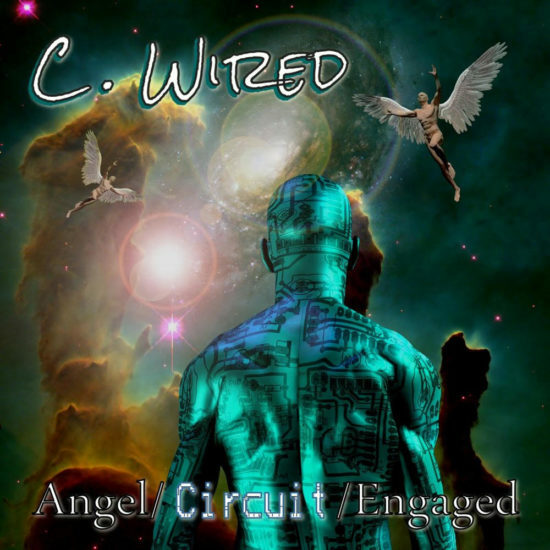 Fans of eclectic rock music have a lot to be excited about with the release of Angel Circuit Engaged, the all-new EP by the critically acclaimed C-Wired. Boldly produced by none other than the brilliant Addison Smith, Angel Circuit Engaged sees C-Wired advancing their experimental sound towards more lumbering, hard-nosed rock territory, but it does anything but abandon the group’s core ideals first demonstrated in the Omega extended play. Giant riffs and searing solos are commonplace in this record, peppering otherwise simple songs with a colorful dexterity that anchors them to the virtuosity of classic rock. Though jam-packed with gargantuan guitar brutality from start to finish (in varying degrees), Angel Circuit Engaged isn’t overly studded with fretwork as a means of compensating for a lack of lyrical creativity. This EP has a distinctly progressive vibe to it, carrying us from one stylish storytelling session into the next with little to no interruption in the fluidity between tracks. The music is diversely appointed with subtle intricacies that instantly set it apart from C-Wired’s closest contemporaries, and if you came looking for a wildly original sound from an exciting young group, you’re going to be quite pleased with what you find here. Angel Circuit Engaged is surprisingly heavy, smacking us hard with the unstable grooves of “Persian Woman,” the layers of metallic might in “Botticelli Baby and “Angels Are Not Afraid of the Dark,” and grinding tonality of “Climb the Mountain,” but I wouldn’t say that it’s solely dependent on its weighty riffing to make a statement. You can tell, without listening all that closely, that Addison Smith spent a great deal of time refining this record’s grittier moments, but there’s not a doubt in my mind that all the legit sizzle was left completely untouched in the finished product. The title track easily has the most adrenaline of any song here, but it isn’t throttled at us all at once. Much like the 50’s-inspired rocker that closes out Angel Circuit Engaged, “Little Sisters,” the opener is somewhat restrained by the playful rhythm that it employs, essentially ensuring that the music remains within grasp of mainstream audiences. Stocked with vicious grooves and smart, catchy lyrics that engage with us on as deep a level as the music itself does, The latest release by C-Wired is a space-aged rock record for a space-aged generation of rock fans who aren’t satisfied by cranked amplifiers and anthemic vocals alone. There’s a lot of dimensions to this release, arguably many more than there were to Omega, and in the course of my studying it over the last day or so I’ve found that it only grows more and more captivating with each focused listen. While on the surface it could be easy for one to become distracted by all that Angel Circuit Engaged has to offer listeners on a cosmetic level, I think that the bigger legacy this record will have for C-Wired will be in advancing the trajectory of their artistic growth in a more jagged, rebellious direction than any of us – critics or otherwise – could have predicted taking place.